When making calls into the InstantKB Web API you'll always need to provide at minimum an "Application key" to authenticate the request. 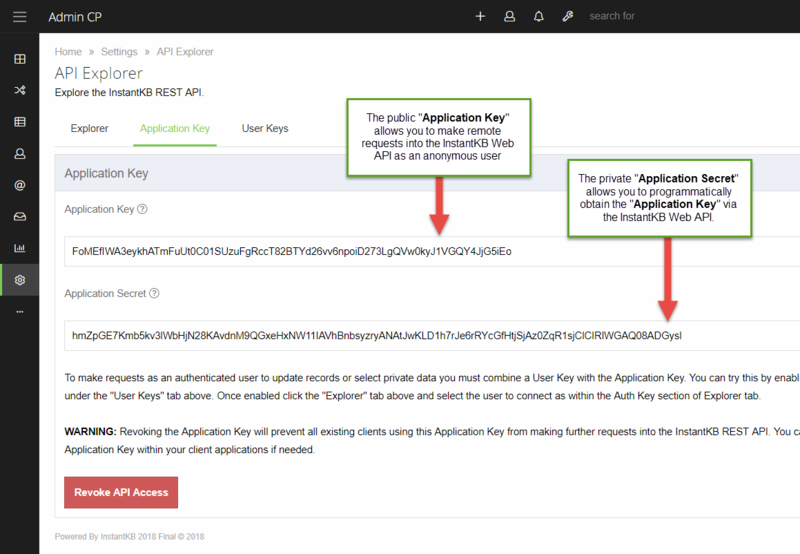 The application key can be shared publicly and is only used to make anonymous requests into the InstantKB Web API. The application key can change and can be used to globally revoke remote access into the InstantKB Web API. Should the application key change you can use the application secret to programmatically obtain the latest application key via the Web API. The application secret never changes and should not be shared or visible to end users. The application secret can be used to programmatically obtain the latest application key via the InstantKB Web API. You can then use the returned application key for subsequent anonymous requests via the InstantKB Web API.